Home › New Content › New content from Cascade Locks, OR! New content from Cascade Locks, OR! The Historic Oregon Newspaper Program (ODNP) has recently been able to add exciting new content from Cascade Locks, Oregon. Now available online, issues from March 3, 1939 to September 1, 1939 of the Cascade Locks Chronicle and The Bonneville Dam Chronicle are ready for your viewing pleasure! Covering the period directly after the construction of the Bonneville Dam, this newly added content is a great addition to our already digitized issues of The Dam Chronicle and The Bonneville Dam Chronicle, earlier papers published in Cascade Locks. This project was made possible by sponsorship from the Hood River Library. More than just a wonderful addition to our previously digitized issues of the Bonneville Dam Chronicle, the Cascade Locks Chronicle and The Bonneville Dam Chronicle is actually continuation of that paper under a new name! 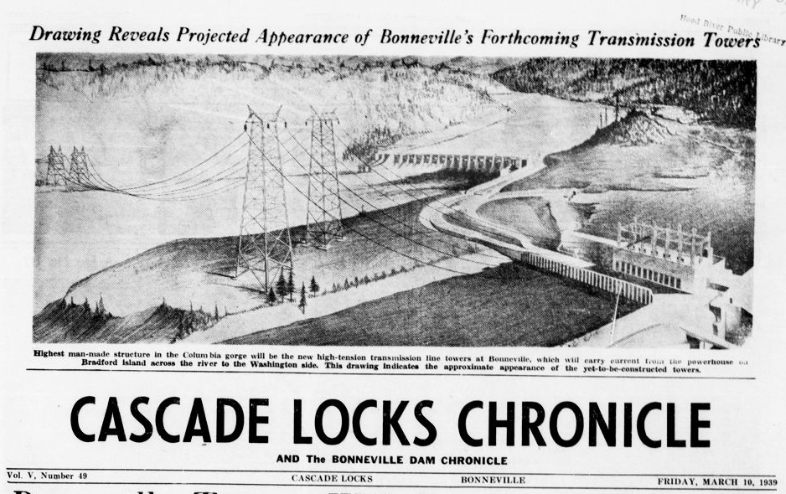 An article published on March 3, 1939 explains that because the construction of the Bonneville Dam had reached its completion, the paper saw it fit to change its name to the Cascade Locks Chronicle, the town in which it was published. The addition of the Cascade Locks Chronicle and The Bonneville Dam Chronicle to our digitized newspapers works as a bookend for our collection of digitized papers on the construction of the Bonneville Dam in Cascade Locks, OR. The construction of the Bonneville Dam was a momentous and important moment in Oregon’s history. When its construction finished in the 1930’s, it was the largest dam of its kind in the United States! Anyone looking to do further research on the Bonneville Dam can find a wealth of information and primary source material on the Oregon Historic Newspapers website. As of now, we have three different papers published about the Bonneville Dam digitized online. These papers are the Dam Chronicle (1934), the Bonneville Dam Chronicle (1934-1939), and the newly added Cascade Locks Chronicle and The Bonneville Chronicle (1939). Doing research through ODNP is easy thanks to optical character recognition (OCR) technology, which allows our issues to be keyword searchable! In addition, these historic Cascade Locks’ titles, as well as all of our digitized newspapers, can be downloaded as a PDF or JPEG file and saved for future reference or research purposes. All these services are at absolutely no cost to visitors of Historic Oregon Newspapers so don’t wait, and take a look at Oregon’s historic newspapers today! ‹ New content from West Linn, Oregon!